Norman Mailer. His “biography” Marilyn has sold millions of copies and his been read by countless fans. The best part? It’s nothing but lies. 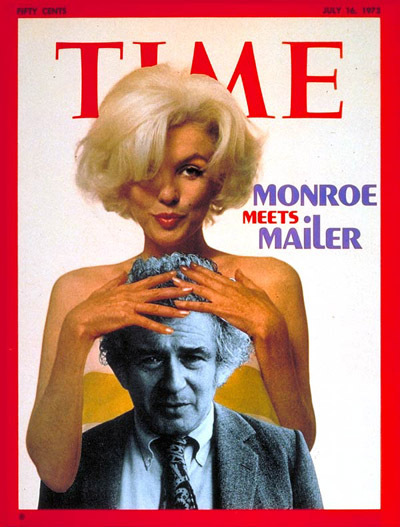 Norman Mailer has become a bit of a sad joke in regards to Marilyn. According to multiple accounts he wanted to meet her very much, especially when married to Arthur. He just knew they would have an affair and she would be madly in love with him. The only problem with this is that she had no interest in meeting him. The “Time” cover above is the closest they ever got to meeting. Mailer formed a bit of an obsession and after Marilyn’s death went on to write two books about her. The first was released in 1973 and is simply entitled Marilyn. The second is called Of Women and Their Elegance and is an imaginary diary that Marilyn could have written while living with the Greene’s. Both are 100% fiction. Marilyn makes some pretty big claims. The first is that Marilyn was sleeping with RFK and that he had her killed because of his ruthless ambition. Mailer got this information from Guiles’ Norma Jeane who got it from Walter Winchell who got it from Frank Capell. He claims she had a few abortions (he gets this from Amy Greene) and various other outrageous accusations that are easily discredited once you start to research.